Hazelnuts, figs, cashews, dates. That’s pretty much what’s in this caramel beauty. 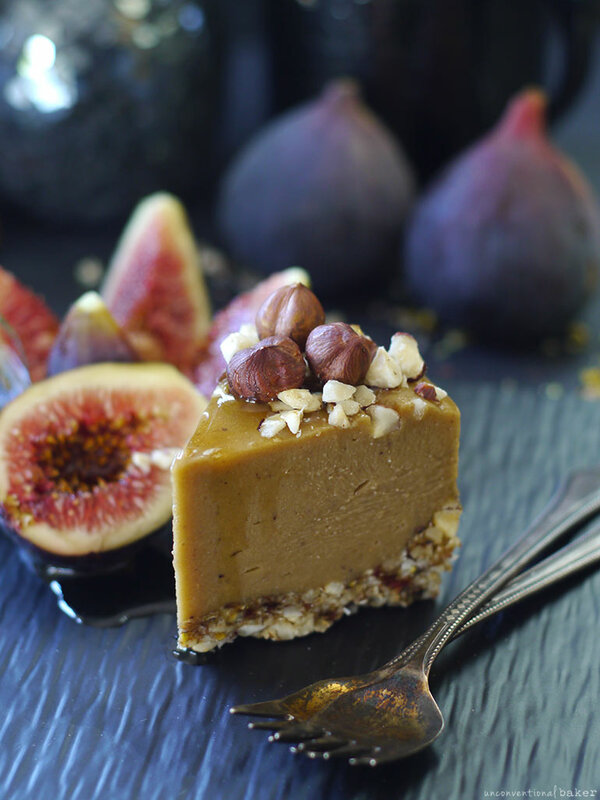 It’s decadent, smooth, creamy, only sweetened with fruits, goes very well with fresh figs, and has a flavor reminiscent of caramel. Hard to believe, but this cake was designed for a person incredibly limited in ingredient choices and in need of a little wedding cake! Ok, where’s the blushing emoji?! Eeek such a lovely compliment! 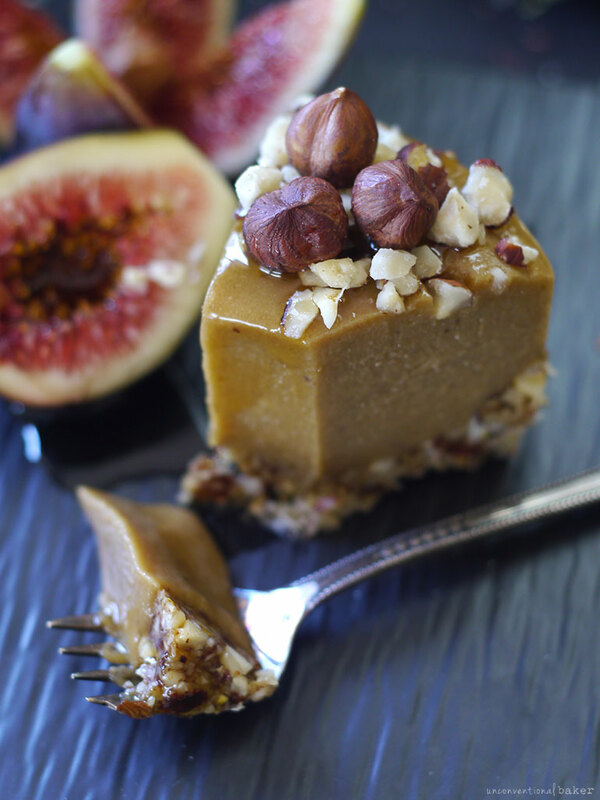 …nuts (including peanuts) & nut butters, almonds, almond butter, dates, date syrup, figs. (bingo! nuts + dates + figs, all I needed!). When you look at a list this big it can seem really overwhelming. But with nuts and dates I feel safe — I always feel like you can go for miles with those two; infinite dessert possibilities. So I got to work, tried out a few cakes, sent them out to friends for reviews, and this one was the clear winner. I adhered to the specific ingredients list, but added *optional vanilla* (for those not on this diet specifically) because you can never go wrong with some. I also felt that a bit of orange extract or a bit of orange zest would have been nice in this too, so adding it in as a thought. Note: I used date syrup for sweetening the cake. You could use something like maple syrup instead, though the date syrup gives it a nice caramel-like flavor. Also, the hazelnuts can be swapped for another nut, like pistachio or almonds. Last but not least, as per usual, this recipe is for a tiny 5″ cake. See downloadable cake size guide below if you need help with sizing this cake up or down. Also, if you need any tips to get comfortable with raw cake making, you may find Unconventional Treats handy for that. 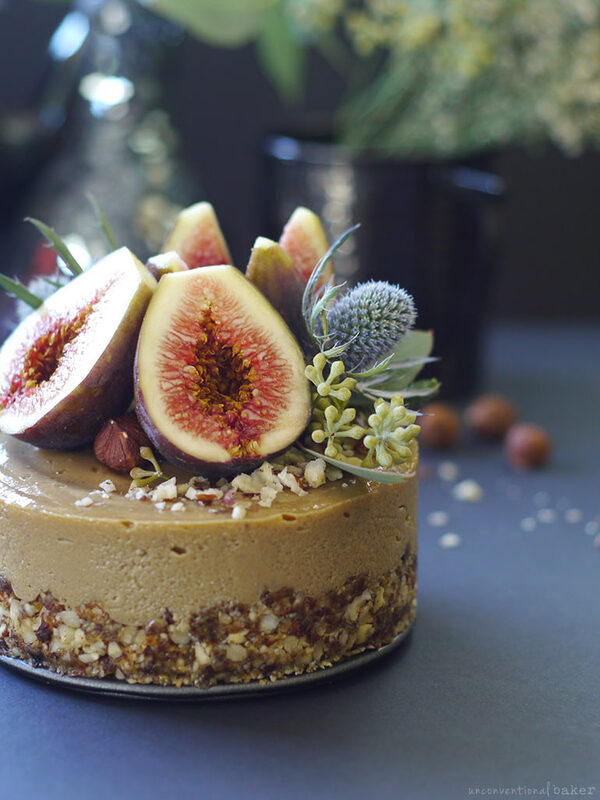 This fig hazelnut caramel cake (vegan, paleo, gluten-free) is decadent, smooth, creamy, sweetened with fruits, and has a flavor reminiscent of caramel. Process all crust ingredients into a fine sticky crumble in a food processor. Transfer to a 5″ springform pan and press down into an even crust. Freeze while working on next step. Blend all filling ingredients into a smooth consistency in a power blender. Pour over prepared crust. Freeze for 5-6 hours or overnight. Decorate with desired toppings and serve. Enjoy! (Note: keep cake frozen until serving; store leftovers in the freezer). This post contain affiliate links to the following products: raw hazelnuts, medjool dates, date syrup, cashew butter, salt, raw ground vanilla bean, pure vanilla extract, food processor, power blender. Would it be ok to use soaked cashews rather than the nut butter? Raw cashews have a very different flavor than the nut butter, as well as texture. Nuts in nut-butter aren’t usually soaked (and are typically roasted) so the flavor is more concentrated, and often sweeter (as compared to the more diluted flavor of soaked cashews). The consistency will be a bit different too in the process of making cashew butter the cashews release their oils so the butter will act a bit differently than soaked blended cashews. audrey, can we substitute maple syrup and use dried figs? Also, to make this large enough for a 6inch round, what do you suggest? Hi Grace, you can definitely make this with maple syrup instead of with date syrup. You’ll want to re-hydrate the figs in some water first (just cover with water and let sit for about an hour, then discard the water and use the moistened figs in the recipe), but that would be totally fine too. As for converting to a 6″ cake — definitely doable. There’s a downloadable “raw cake multiplication helper” guide at the bottom of the post (below the recipe) to help you with that. Let me know if you have any questions about it. Because I can never make up my mind, I usually keep two or three recipes in mind while working from another. So for the filling, I added ½ cup dark cocoa powder, and to decorate, I used small black figs drizzled with ginger syrup, dotted with vegan butter, and baked at 350 degrees for 20 mins. Cut into halves, they were placed at the bottom edge of the cake as well as on top with flowers and nuts (yours was hands down the winner in the aesthetics department but it was still pretty). Everyone at our dinner party wanted the recipe! I doubled the recipe which filled a 6″ springform pan about ½” shy of the top. It was incredibly easy to make. Iʻm already fantasizing about when I can justify making it again. Thanks very much. That sounds amazing, Sarah! Now I’m dreaming of ginger syrup over here ? Thank you so much for sharing what you did, and I’m so happy it went over well at the party! This is my first time on your site, and I have yet to try any of your recipes, but I am so impressed with your ingenuity and sense of aesthetics. All your recipes look truly professional and sound like they are truly delicious. 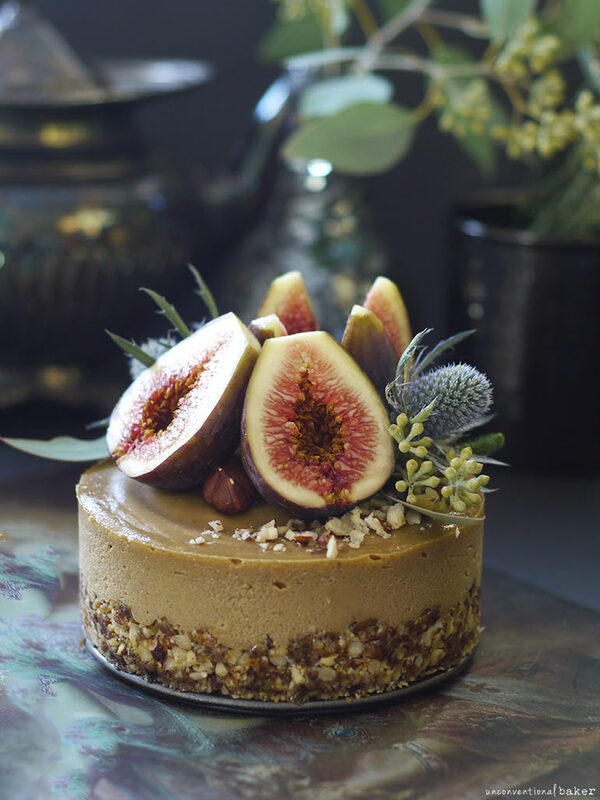 Haven’t seen a more beautiful raw fig cake in my life! Look at the caramel layer and the fig topping! 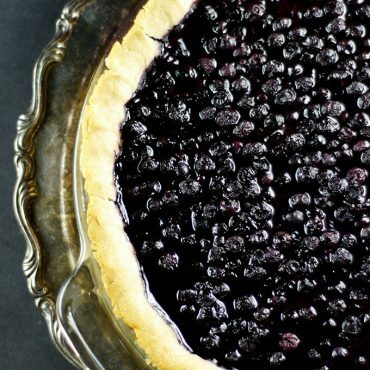 I love that you made this recipe dedicated to a reader’s requests. Cheers! I love this recipe, this is very short and simple to understand. And it gives awesome cake which makes our party colourful!!! Everyone must try…….. This cake looks divine! I’m sure my grandmother would accept vegan food more if I whipped up this recipe for her – she loves these flavours (and of course, so do I!!)! Your creations are just amazing Audrey – every cake of yours is drool-worthy! 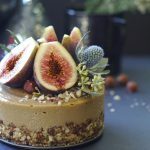 Your blog is definitely my go-to for any vegan cakes, for sure! I hope your grandmother gets to try a slice sometime ? Can you please provide the nutritional information on the Fig hazelnut Cramer cake? Hi Karla, sorry, I haven’t looked up the nutritional info. You can look it up for yourself though via many different kinds of recipe calculators online — they’re free and you can enter in exactly what you’ll be using, how many portions, etc. and it’ll give you a good idea of recipe breakdowns. This looks insane Audrey! absolutely beautiful, perfect for a wedding for sure! Thank you, Hanne :) If only cake making counted as a super power ? Audrey!!! ?? You rock big time, lady!!! ?I can’t wait to try making this and to see the smile on my sisters face when she realizes that THIS IS FOR HER! Not just to look at but something she can eat. I’m so happy! There is no emoji to show the size of the grin on my face right now! Can’t wait to try this perfect creation! Thank you from the bottom of, not only my heart but also from my whole family. This is truly and utterly amazing, Audrey!!! ?????? Hehe. Thanks so much, Keren! :) It was a fun one to play around with ?? Thank you very much for making this recipe, it’s really nice. I have still not tried to make it myself, but it was a wonderful surprise on our wedding! (Yes, I am the sister?) And one day I will try to make it for me and my family? Thank you once again? So by now you’re quite the hero here and one of the giant supermarkets here has asked to post your recipe on their Facebook page, with credits of course! Would that be ok with you? About the recipes, I don’t wish for them to be re-posted elsewhere outside my blog, however if the supermarket wanted to share a link to the recipe instead of posting the actual recipe on their page that would be totally fine and greatly appreciated. 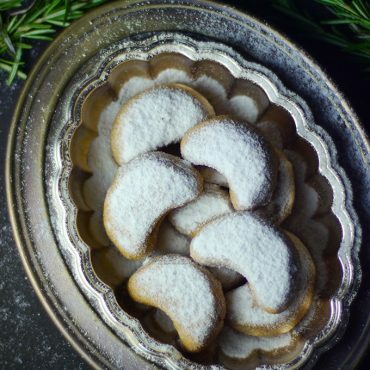 Such a cute and lovely recipe, Audrey! And so beautifully decorated! Thank you, Natalia :) I tried to dress it up a little. If the list had stopped after that first little snippet…oh man!!! Actually I wound’t put it past you to pull off something amazing and totally wedding-approved even with just that first list, but it would’ve been veryyyyy tricky :D Turns out this very specific list actually led to a cake made of many of my favorite things! 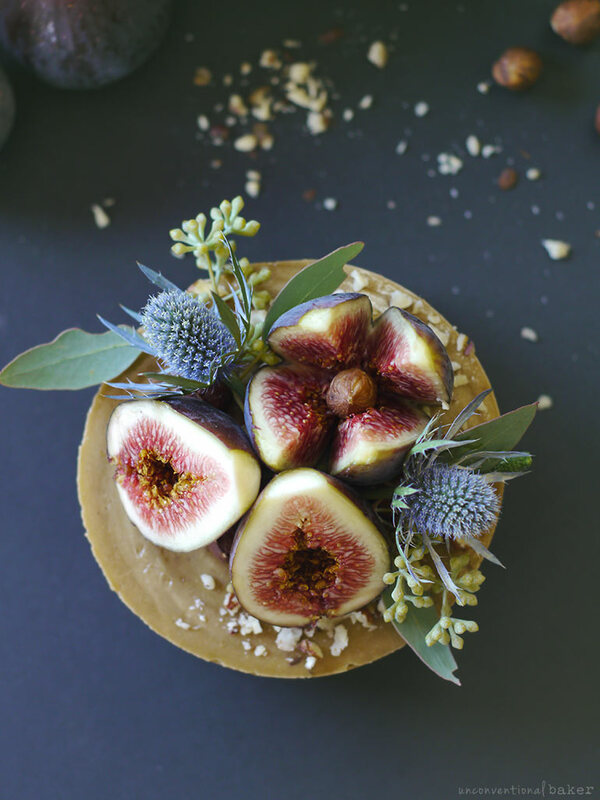 Cashew butter, dates, and the always elegant figs. Love how you styled this too with all the little natural bits. It’s like ingredient puzzle magic you do over there! Isn’t it funny — in the end, it wasn’t such a big challenge after all. Definitely would have been tough with the first snippet only though ?